OneRepublic is getting ready to hit the road for a string of headlining dates this week as their new single “Secrets” debuts on the Top 40 radio chart at #37! The Colorado based band will head back out on tour this fall joining friends Maroon 5 for a thirteen city trek. “Secrets,” the second single off OneRepublic’s new album Waking Up, reacted instantly at radio and is sure to top the charts just as first single “All The Right Moves.” The band will perform “Secrets” on Live with Regis & Kelly when they broadcast from Price Edward Island on July 15th! OneRepublic was also just nominated for a Teen Choice Award for “All The Right Moves” in the category ‘Choice Music: Rock Track.’ Fans can vote for OneRepublic now at www.teenchoiceawards.com. The Teen Choice Awards will air on Fox August 9th. 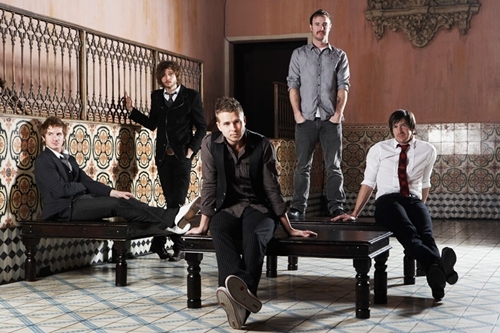 In 2007, after seven years together as a band, OneRepublic took the world by storm with their debut release Dreaming Out Loud. The album included the smash first single “Apologize” which shattered digital sales and airplay records worldwide, and along with second single “Stop And Stare” propelled the album to platinum plus sales. Their sophomore set Waking Up was released in November and first single “All The Right Moves” was a Top 40 and Hot AC radio hit and has sold over 1.5 million units to date! “Scream”-Ozzy Osbourne’s first album in three years and 10th studio album overall–has entered the charts in the Top Ten in seven countries. Beyond earning the #1 slot on the charts in Greece, SCREAM’s chart entries include: U.S., #4; Finland, #3; Japan #4 (international chart, #11 on combined chart); Norway, #5; Canada, #4; andGermany, #7. In his native England, SCREAM is at #12; it also is #11 in Australia. The acclaimed album (see quotes below) was released June 22 via Epic Records, with first single “Let Me Hear You Scream” now #1 on both Active Rock charts and still #1 at Mainstream Rock for the 5th week. Just before SCREAM was released, the rock icon hosted a Sunday afternoon in-store CD signing at Amoeba Music in Los Angeles (June 20). The first 600 fans who purchased a copy were also given a free ticket to that night’s 10:00 PM House of Blues show. OZZY and his band–new guitar player Gus G., bassist Blasko, drummer Tommy Clufetos and keyboardist Adam Wakeman–raised the roof with a red-hot performance encompassing new material and his many classics. The multi-platinum, Grammy Award-winning, Rock and Roll Hall of Famer recorded most of SCREAM at his Los Angeles home studio, The Bunker. It was produced by OZZY and Kevin Churko, both of whom did the same honors for OZZY’s 2007 worldwide million-seller Black Rain. OZZY co-wrote all the songs, primarily with Churko. OZZY will embark on an 18-month world tour in support of SCREAM. His U.S. dates will kick off with an August 12 performance at the 70th anniversary of the Sturgis motorcycle rally in South Dakota before he launches this year’s OZZFest on August 14. The six OZZFest dates will feature the main stage line-up with full sets from Ozzy, Mötley Crüe, Rob Halford, DevilDriver and Nonpoint. Second stage headliners and six-time OZZFest veterans Black Label Society will be joined by Drowning Pool,Kingdom of Sorrow, and Goatwhore, Skeletonwitch, Saviours and Kataklysm. Each OZZFest date will include 13 bands on two stages with music beginning at 1:00 PM. In addition, concert-goers can once again visit the OZZFest “Village of the Damned” featuring a mix of interactive activities, shopping and entertainment throughout the venue concourses. Maroon 5 have premiered the official video for their new single “Misery.” Watch front man Adam Levine take a serious beating from his lady in the action-packed clip directed by Joseph Kahn (Britney Spears, Blink 182, Muse). “Misery” appears on the Mutt Lange produced “Hands All Over” due out September 21st. American Bang’s video for “Wild & Young,” the debut single off their upcoming self-titled album, has now been added to MTV’s AMTV morning playlist. MTV is holding a contest for all band’s on AMTV, where the band with the highest trending topic on Twitter worldwide, will get a special half hour on Monday (7/12) dedicated to their videos. Alexandra Amor rose to fame online by covering her favorite pop songs, but she really started to shine once she hit the studio to record her own original material, with producers including The Agency (Ciara, Jordin Sparks, Cody Simpson), Naz Tokio (McFly) and Da Internz (Jesse McCartney, Sean Kingston). A peppy, polished pop anthem full of high energy vitality and sassy sing-along lyrics, “Superstar” is the first single off Alexandra Amor’s debut album, due out soon. Oceana connects! Just as the ocean connects continents, this young singer joins soul music of the ’60s with modern beats and contemporary texts. Oceana connects black to white, funk to soul, modern soul to jazz and pop. She manages to transport traditional styles of music to the present day through her unusual voice, charisma and stage presence. Her music is international, authentic and bubbles with energy. It has depth and is fun, even when she sometimes lets the more sombre side of her personality emerge. Oceana (in her mid-twenties), uses her personal experiences in her lyrics to sing about desire, love and life. It is said of many Artists that they are born with a gift for music. While this can be an overused and sometimes incorrect expression , it really does apply to Oceana. The release of her debut album at the start of 2009 surprised us all. Knowing the story of her background, one wonders how much a person can subconsciously be influenced by the lifestyles of their parents. Is there really a musical or creative gene? Why, otherwise, does Oceana speak more of having the need to travel than of being homesick and feels the desire to keep discovering new things and expand her horizons? OCEANA’s mother, a German Haute Couture fashion designer, moved to Paris because of job and was immediately fascinated by its varied music scene. She was especially taken with the African rhythms and in the evenings she could be found in the city’s hippest reggae clubs. There she met and fell in love with an attractive musician from the French Caribbean colony Martinique. The fruit of their love, OCEANA, followed shortly. After spending her early childhood in the “City of Love”, OCEANA moved with her mother to live near Hamburg, where they lived with her grandparents for the next few years. Mother and daughter often lived out of a suitcase, travelling between Germany and France, where OCEANA’s father was working as a musician and DJ when not travelling around the world on tour. “I always received a lot of postcards from around the world from my father. He sent me photos and videos of gigs and I thought it was great to have a father who was a musician, even if he never picked me up from school and was not there for ballet performances. I never had the “normal” family life, which most people know”. As her grandparents were sought-after Artists, it was normal for OCEANA, from an early age, to be surrounded by singers, artists, musicians and people from the film industry. One afternoon she met the legendary musician Maceo Parker, a family friend, jamming with her grandfather in the garden. Maceo Parker often asked OCEANA up on stage at his concerts and last year he even gave her a solo during one. Parker plays an important role in her life. From an early age it was clear which direction she would take. OCEANA’s whirlwind path could not be stopped. Her mother started taking her to concerts as a young child. She saw big name Artists including Ziggy Marley, Burning Spear, James Brown and she felt drawn to the stage, where she wanted to sing and dance. She took ballet lessons, danced through studios and at the age of five she was given a part in a film directed by Hamburg’s Lars Becker. As a teenager she won a music scholarship and had her first singing lesson with the Italian vocalist Etta Scollo. Her natural strength and disciplined nature have helped OCEANA to establish herself and make her way in the business. Today OCEANA is a modern, confident young woman, who knows what she wants. She actually knew what she wanted from an early age. She moved away from home when she was 16 years old, travelling constantly for the next few years. “I always had an extraordinary lifestyle, was always independent and boxed my own way through life. I didn’t need pocket money – I learned from early on, how to manage on my own.” OCEANA never felt homesick, but always felt the need to travel and sees herself as a “citizen of the world”. A real cosmopolitan, she has lived in Paris, Hamburg, London, New York, Los Angeles and a fair amount of time in Martinique, in order to discover her Caribbean roots. She earned her living through gigs and was constantly improving her knowledge of song and dance. Aside from music, she is particularly interested in fashion and photography. She is also very loyal to her family and friends. When she moved back to Germany she worked as choreographer on videos for Seeed and Fettes Brot. She has also worked as a backing singer for Seeed’s lead vocalist Demba Nabé and has gained live stage experience on tour with Seeed and Boundzound. Just lately she was support act for Germany’s Peter Fox. It was Maceo Parker, who last year made her finally start thinking about working on her own career as a vocalist. “He gave me the deciding PUSH! Over the years I had kept writing my own material, but after a concert Maceo said to me “You’re ready now; do your own thing!””. Luckily this sentence took seed and she did not forget it. She started working in London on several songs and travelled to New York to record her debut album “LOVE SUPPLY”. Suddenly things started to move quickly, the team worked well and they produced a fantastic album in a short period of time, which mixes the finest soul-pop, funk, R’n’B and reggae to make the rounded, international-sounding, top-quality album. Brother Clyde is the new rock band started by country star Billy Ray Cyrus. The Los Angeles based combo also features Samantha Maloney (Mötley Crüe, Hole, Eagles of Death Metal) and guitarist Jamie Miller (theSTART, Snot), within its ranks. The band will be releasing their self-titled debut album on August 10th via Buena Vista Records/Fontana. The first single from Brother Clyde, “Lately,” is available now on iTunes. “I always loved rock ‘n’ roll,” Cyrus says. “That was a heavy part of what I was as a young juvenile delinquent. I tried from my first album to rock like any other Southern rock band.” Fate – and country music immortality – intervened, but for Brother Clyde, he followed an oh-so-rock-and-roll dictum: No rules. No limits. No preconceptions. The first single from Brother Clyde, “Lately,” was written by Tancredi, and is available now on iTunes. After a few acoustic grace notes, the song comes down hard with a broadsword of power chords and a lamentation about a faithless world. With its throaty harmonies, “Lie to Me” picks up on the theme, only writ small, tracing the lines of a ruined relationship. There’s no let-up with “Waiting,” a punishing rocker drawing from an emotional pool of deep sadness yet a will to survive. Cyrus digs even deeper on “Slip Away,” “How Long” and “Crawl,” the latter a rocker with echoes of Jane’s Addiction at its most furious. The album ends with Johnny Cash’s “Walk the Line,” recorded in 1998 with Cyrus and a line-up of all stars. “I was at a place in my life where I didn’t fit in with all the hat acts Nashville had at the time,” he says. “I just wanted to rock.” So he assembled drummer Owen Hale, keyboardist Johnny Neil, bassist Allen Woody, guitarists Mike Estes and Ed King, and harmonica player Michael Jo Sagraves, and the rest is basement tape history. Literally. It was recorded live in Johnny Neil’s basement.